Last week I was struggling with the consequences of saying yes to too many instruction requests. I should have been a bit more controlling and spaced them out a bit, but I ended up agreeing to each instructor’s preferred dates and scheduling them all in the same 5 day period. Although doing so didn’t leave me with much time to work on other projects, at the end of the week I was intimately acquainted with our library instruction classroom lab. It’s wired! The instructor computer is hooked up to a projector so that we can share our screen while teaching, and each of the students have their own computers to follow along or work on independent activities and research. We have rolling chairs. It may seem silly, but having comfortable chairs for students makes a huge difference. We can schedule our sessions ahead of time using a nice online reservation system. It’s small. It’s a nice intimate space. We have a nice large whiteboard wall perfect for brainstorming and illustrating research concepts not related to the mechanics of resource searching. It’s not a dedicated library instruction space. This classroom can also be scheduled by Writing Center faculty, and when not in use for classroom instruction it is a 24 hour open computer lab for students. The result? Empty food and beverage containers abound, furniture in disarray, and a general dirty feeling to the room in the mornings. Giving yourself 5 minutes to tidy up before a class is a must. It’s the only one of its kind. This room is used for a wide range of library instruction and books up quickly! Couple that with the fact that ALL of our first year seminar classes (the heaviest library instruction customers) take place at Noon and we end up not able to accommodate all classes in this room. We do have 3 other library instruction spaces on the 3rd floor of our building. Although they all have multimedia stations and projectors for instructors, they do not contain the student computers necessary for hands on research. It’s small. For a small class, it’s a great fit, but trying to include a group larger than 15-20 students is difficult. The giant table in the middle. It’s too big and bulky for the space. The student computers face the walls. I can only imagine that when this was done it was to make sure that the instructor could see the students’ screens during class. Or perhaps it was just the best way to fit computers in the room. Either way, it’s ineffective. Students that are going to go off task during class are going to do it whether or their professor can see their screens or not. With this set up we may be able to see the students at all times, but the students have to stop what they’re doing to pay any attention to the projection screen or the instructor. 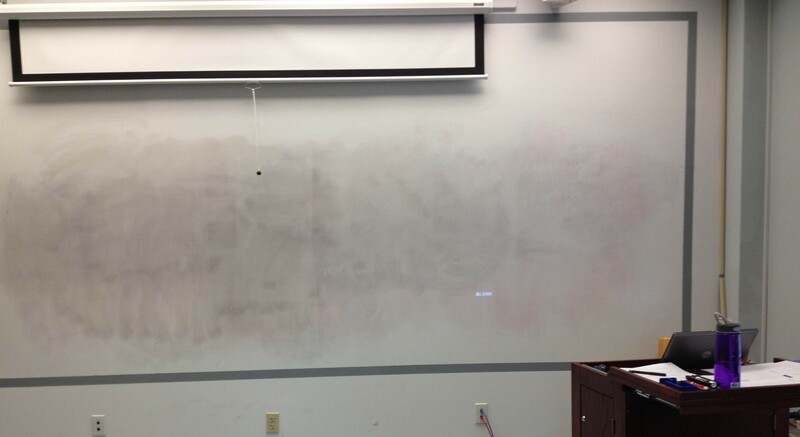 The projector screen completely covers the whiteboard (or white wall in this case). As I’m showing students a database, the catalog, or other online resource, I can’t use the whiteboard wall to illustrate a search strategy, brainstorm keywords or do any other kind of scribbling because the space is almost completely covered. As I mentioned earlier, the fact that we have a classroom space at all is a huge benefit to our instruction program, but if someone asked my to plan my ideal library classroom it would look quite different. There’s a great discussion going on at the moment through the ILI Listserv about information literacy instruction spaces. I’ve been comparing some of what I’ve seen people write about with our current library classroom and the spaces I used to teach in at the University of Houston M.D. Anderson Library to come up with my ideal library instruction scenario. We’ve been given an unlimited amount of money and space has magically been carved out in our existing building without impacting anything else. The result? The classroom space is a dedicated library instruction space. No sharing. Sorry, kids. There are multiple whiteboards in the classroom. This is so necessary for teaching while explaining a point in an online resource and can also be used for simple active learning exercises. Computers for all! There’s an instructor station with projector hook up and each of the students have their own up to date, working computer. Since this is my dream space, the computers are all laptops, students don’t have sticky fingers and these machines don’t disappear. A working printer is in the room. Collaborate work space. Instead of our oak monster, I really like the look of these learning pods at Baker College of Muskegon. Multiple projector screens in the room. This way all students don’t have to be facing the same direction all the time. Also, these projector screens won’t cover the whiteboards. 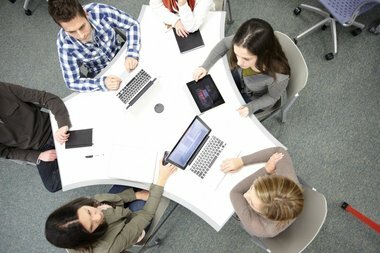 A way for students to project their own work from their computer to a screen. At UH we had classroom management software that allowed us to see what students were looking at on their computers. We didn’t use it to police students. Instead we used it (when it worked) to share a students’ screen with the class to illustrate an effective search or an important question, or to troubleshoot an issue the student was having. It was a nice way to hand over portions of the class to the students. The instructor station is small or moveable. I dislike feeling chained to a big bulky podium, but I do still need to show certain resources online. A smaller, less obtrusive instructor station would be a good compromise. I’m sure there are other features to my dream space that I’ll think to add later in the semester, but this is a good start for now. What does your ideal library instruction space look like?